Stock markets have continued their quiet march higher. Investors who missed the boat are still waiting for a meaningful pullback. Since the October lows the S&P 500 has seen exactly one day in which it dipped more than 0.5% below the previous days low. That was on November 4th, now almost a month ago. Can we go another month without even a 0.5% pullback? Probably not, but as long as enough investors are looking for a chance to get back in on any “weak” day, so long pullbacks may be very shallow 1 to 2% affairs. Maybe it will take some unexpected news item to knock this market down, that is always possible. The breakout to the upside is now clearly visible. How far can it go? The 4800 level is likely to offer some overhead resistance, and a quick dip back to 4700 or even 4600 is easily possible. But buyers may step in equally quickly. Technically the Earl2 is topping out and ready to turn down any day (it has already turned down for S&P 500 and Russell 2000). The faster Earl is going up and likely to paint a bearish divergence. 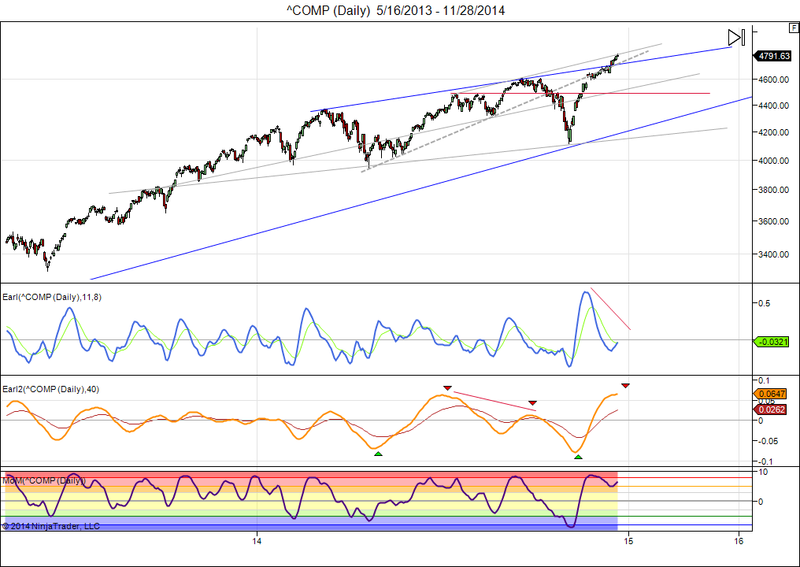 The MoM indicator is starting to show a bearish divergence as well. So, we have several warning signs and we are also in a new lunar red period. This is not the kind of setup I want to buy with both hands. I think we will finally get some weakness in the next couple of weeks, and it wouldn’t even surprise me if we get a rare down December. 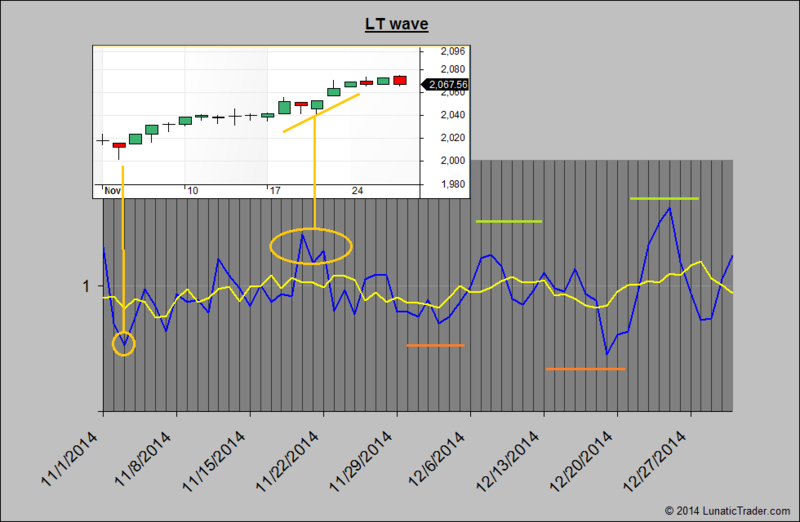 For November the LT wave had its lowest value on the only day that got us a bit of a pullback. Expected periods of weakness merely kept the market flat near highs, with the expected strength in the 3rd week giving the S&P another push to record highs. For December we see weaker and stronger periods alternating. Expected weakness in the first week, followed by a bounce. The lowest LT wave value comes on December 19th, with the days leading into December 25th showing as the main period of strength. Remember, this LT wave is experimental, so use with the necessary care. This entry was posted on December 1, 2014 at 11:35 am	and is filed under Financial Astrology, Market Commentary. Tagged: LT wave, lunar cycles. You can follow any responses to this entry through the RSS 2.0 feed. You can leave a response, or trackback from your own site. If today closes low, it will be two consecutive closes on low for S&P – the first time since the dip. Structure’s changed. Yes, for now the market is more in a sideways mode so far this month. We will see what comes next. I closed today China long trade. Probably the move is not over but how much such ‘vertical’ moves are sustainable? I will reenter at next correction. It’s been 150 days in the trade, I wouldn’t take without your sugestion. Massive 30% gain on my ETF. Well done. It is always nice to hear when readers found good use in some of the suggestions given on this blog. This is the post were I pointed out that China was ready for a breakout move: https://lunatictrader.wordpress.com/2014/06/23/buy-china/ The 3000-3500 level is likely to put up resistance, so it is not a bad idea to take some money off the table here.